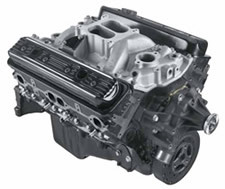 HT383 - A big-inch small-block tuned for torque! There comes a time when you may not just want more power, you may need more power. 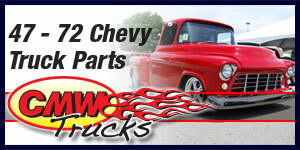 Times like when you are towing your show car or bass boat with that 1970s-and-earlier GM truck, and it just doesn’t have the low-end grunt that you need to flatten hills or make a safe pass. For those times, our engineers designed the HT (high torque) 383 with lots of cubic inches and other components to enhance the low-rpm power that you need. The GM Performance Parts HT383 has been specifically engineered for low-rpm torque, and it’s packed with durable parts that are all brand new. It produces 435 lb.-ft. of torque at 4000 rpm, but more importantly, it produces more than 400 lb.-ft. of weight-moving torque from 2500 rpm all the way up to its 4000 rpm peak. In other words, your trailer’s worth of weekend fun is barely noticeable when hooked to a vehicle equipped with the HT383. The bottom end has a 383 stroker forged steel crankshaft, heavy-duty rods, and hypereutectic pistons. The block is cast iron with 4-bolt main caps, and it’s up to the task of making lots of power for years to come. The brand new HT383 makes a great alternative to salvage and rebuilt engines. Once installed, the HT383 makes it possible to look forward to that big hill or long haul. Don’t just drive to your favorite fishing hole—be the first one there!